Experts say the right time to buy a home is when you feel right about purchasing. Here, are seven important factors on why now may be the best time to buy a home. 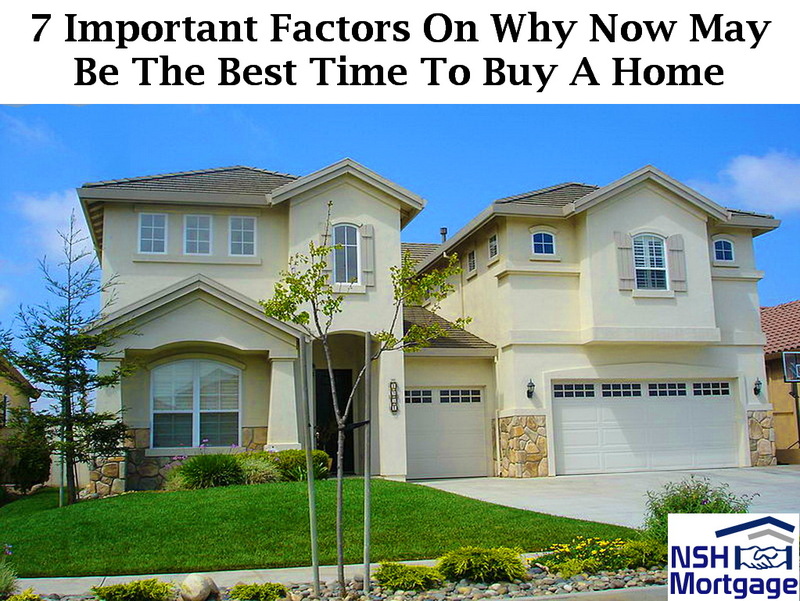 NSH Mortgage has the knowledge and tools that can help you in figuring out when is it the best time to buy a home. That means being financially and emotionally ready, of course. Additionally, this could be the best time of year to buy a home and hit both of those goals. But truth is, certain times of the year can be better for buying than others, based on the market. Many believe we are heading into a friendly season for home shopping. That is due to many factors. One is that colder weather may bring out less buyers competing with you for houses. In addition, new research suggests buyer confidence is up. Current favorable conditions may make this an ideal time to hunt for a home and score a deal. So explore your housing market. Take advantage of factors in your favor. Indeed, when you are ready, to commit to buying. Your timing will be perfect. The HPSI rose in September by 0.3 points to 88.3. It is up 5.5 points versus one year earlier. More Americans polled by Fannie Mae now state that it is a good time to buy a home: 28%, up 10% points. More Americans say it is a good time to sell a home: 38%, up two points, and just shy of the survey high of 39%. Fewer think that home prices will increase: 40%, down eight points. More and more people are feeling more secure in the workplace: 75% say they are not concerned about losing their job, up one point. The biggest driver for the increase in the HPSI is the rebound in the good time to buy sentiment. This was especially true of renters surveyed. Perceptions of easing inventory helped boost the net share saying that now is a good time to buy. It is said that this corresponds to less home price appreciation sentiment during the month. Things have been positive in our country, with the stock market being up and job security is strong. Also, with unemployment currently being down and mortgage interest rates continuing to be low. When things are positive around them, people tend to have a positive reaction. So, how to choose the right closing date. We have now got enough distance away from the last recession. Increased buyer sentiment emanates from people feeling secure. That makes them feel confident. Additionally, that makes them more willing to make a big decision like buying a home. Now is a better time to buy in many locations, pricing wise, than just a few months ago. That is because the winter usually results in lower prices than is true with a summer purchase. As we get closer to the end of the year, the weather gets colder in many areas. As a result, you will see less competition from other buyers in key markets. Plus, many families have already purchased to get their kids settled in before the start of the school year. Others will wait until next spring to start looking. Predicting a best time of year to buy can be tricky. Two years ago, for example, RealtyTrac showed that the best month to buy was October. Earlier last year in 2017, RealtyTrac said it was in February. The best month to buy can vary by location. But many factors can change with economic or other conditions. In fact, that can change the best month or day to purchase a home over time. They caution us that late fall and early winter can actually be a pullback time for some sellers. Many agents advise their clients not to list their homes for sale until the spring. So you may have less housing supply to choose from right now. Still, he says, If you are ready to pull the trigger, there is no better time than the present to buy a home. You will be getting a head start on other buyers who tend to wait until after the holidays to start looking. Some lenders claim that purchase sentiment and buyer confidence do matter. If you feel like your job prospects are positive, you are getting wage increases, the economy is in a good place, and interest rates are low, that can boost your morale and interest to buy. Positive sentiment is a big part of the decision making process for shoppers. Buyers need to feel good. Owning a home is an emotional decision. A lot of times you are willing to make the financial commitment because of your emotions. So yes, these metrics matter. Take stock of your life. Is your job secure, also do you have to relocate anytime soon? Do you have plans to marry or raise a family, and are you comfortable in your chosen area? Do you have enough set aside for a down payment, also can you afford the monthly mortgage payments? These and other questions must be answered before you jump into the market as a buyer. Get pre-qualified for a loan. Talk with a skilled mortgage professional. Know what your limitations are, what you can afford and what you can qualify for. Choose a trusted real estate agent. This person should have experience in the areas you are targeting and be able to answer all your questions. A good agent will help you know when the time is right and how to score the best bargain. Shop the area, not just the home. Think carefully about the neighborhood you want to be in, not just the house. You can change the latter, not the former. Prepare to stay put for a while. Assuming you are not doing a flip, you should normally not buy a house if you think you will not live in it for at least a couple years.